The Dragon Run Creek watershed is comprised of a drainage area of over 10.4 square miles in eastern New Castle County. The 7.7-mile-long mainstem of the creek rises in a swampy area north of Lums Pond and flows due east to its outfall in the Delaware River. The Dragon Run is free flowing but has a tidegate at its mouth, allowing discharge to the Delaware River only at low tide. Thus, there are no tidal influences on Dragon Run. 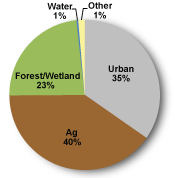 The land use in the watershed is dominated by urban and agriculture uses. There are nutrient and bacteria TMDLs for the Dragon Run Creek Watershed that require 40% reductions in nitrogen and phosphorus loads and 15% reduction in bacteria loads. There are several point source facilities in the watershed but because of the outfall locations that do not discharge to Dragon Run Creek, there are only nonpoint sources of pollution in this watershed. 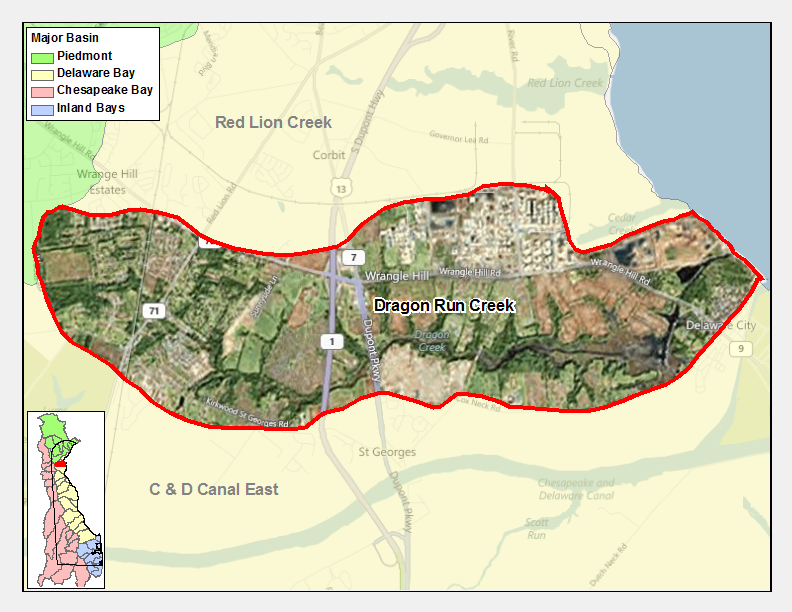 The designated uses set for the Dragon Run Creek watershed include primary recreation, secondary recreation, fish, aquatic life, and wildlife, industrial water supply, and agricultural water supply and public water supply sources in the freshwater segments. The Dragon Run Watershed has four sites listed in the Site Investigation and Restoration Section database. Two sites are state-fund lead (HSCA) sites, one Brownfield program site, and one National Priorities List (NPL) site. If you would like to view reports for any of the sites in the SIRS program please follow the link the DNREC Environmental Navigator to search by map for the Dragon Run Watershed. The soils include the Matapeake-Sassafras association, which has been described by the Natural Resource Conservation Service as, "well drained, medium textured and moderately course textured soils with subsoils that are moderately fine or medium textured" with tidal marsh along the creek and coast line. The soils are level to gently sloping with some steep slopes in the upper half of the watershed along the creek.